Many thanks to Robert Coane for this fascinating article on Schnauzers in Art. Robert is a painter/ draftsman and retired instructor of Painting and Drawing, most recently at the Parsons School of Design in New York City. He lives in Greenwood Lake, New York, USA. He has 2 Miniature Schnauzers with appropriately artistic names - 5-year-old Rodin, a black and silver, and Frida, a 4-year-old salt and pepper. Rembrandt van Rijn in paintings. He supposedly had two, “shown at different stages of their lives”. Albrecht Dürer “who owned one” in a painting. Lucas Cranach the Elder shows one in a tapestry called “Crown of Thorns” dated 1501. A painting by the 18th century English painter Sir Joshua Reynolds (1723-1792). In "The Night Watchman", a statue dated 1620 in Stuttgart, Germany. I have invested countless hours over the past five years researching for images of these works. The results, however, have been meager. 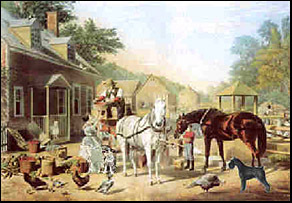 On the website, www.happy-case.ru, there is a Schnauzer in what appears to be a country scene with a carriage, horses and chickens, some houses in the background. The text surrounding it would imply that this is by Sir Joshua Reynolds. But the dress of the figures appears to be more 19th Century than 18th. Also, at least from this reproduction, the Schnauzer appears to have been digitally superimposed! Yet Reynolds portrayed dozens of dogs and people with dogs. 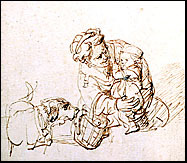 I have found one image, a Rembrandt drawing of a dog scaring a toddler (see image below right), that could pass for a Schnauzer even though you see no detailed beard. The familiar Dürer signature is visible in the lower right but the image is not identified by title and, again, it is only a detail. The rest remains a mystery - no statues, no tapestries. Most people who have researched this subject have the same anecdotes - but no one offers the avowed images. I design and manage a website, From The Doghouse. If anyone has any more information on examples of Schnauzers in Art, I'd love to hear from you." If you are able to help Robert in his quest, please contact him at his website. 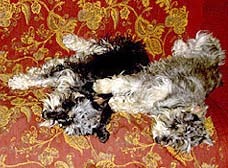 In the meantime, perhaps Robert could help solve the problem of the lack of actual Schnauzers in Art by painting his 2 beautiful Mini Schnauzers Rodin and Frida, seen here relaxing at home! 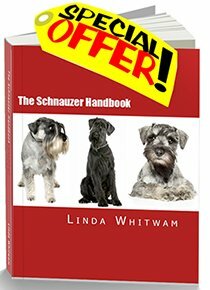 Read more about Schnauzer History.